(York, Pa., Sept. 6, 2017) - With dreary weather in the area and the fate of tonight’s game still up in the air, York Revolution, American Red Cross, and Bailey Coach officials announced this morning that the team’s planned fundraiser and supply drive for Hurricane Harvey flood relief has been extended to include tomorrow night’s doubleheader against the Long Island Ducks. All proceeds from ticket sales for both tonight and tomorrow’s games will be donated to the American Red Cross to directly support flood relief efforts in the Houston area, which includes Sugar Land, home of the Revolution’s fellow Atlantic League team, the Skeeters. PeoplesBank announced earlier that it will match those proceeds and effectively double the monetary support for the region. 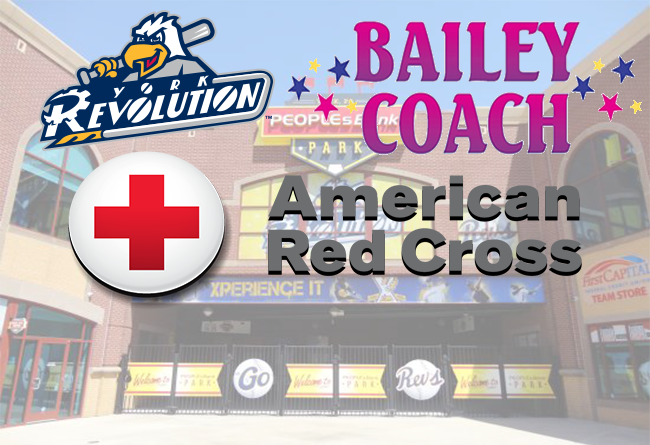 Bailey Coach, a FEMA-certified motorcoach company that has already driven donated supplies to the affected area, will also extend its supply drive and be at PeoplesBank Park for tonight’s game (if played) and tomorrow’s doubleheader to collect donations of hygiene and baby products. Tonight’s game is scheduled to begin at 6:30 p.m. Tomorrow’s doubleheader (necessitated by Tuesday’s rainout) will feature two seven-inning games beginning at 5 p.m. Tickets can be purchased at www.yorkrevolution.com, by calling (717) 801-HITS, or in the Apple Chevrolet Ticket Office at the ballpark. The Atlantic League has been a leader in professional baseball and a gateway to Major League Baseball since 1998. Over 37 million fans have attended Atlantic League games, and more than 800 players and 50 managers and coaches have joined MLB organizations directly from the ALPB. The Atlantic League emphasizes winning baseball games, showcasing the talent of top-caliber players and offering affordable family entertainment to metropolitan markets serving nearly 15% of the U.S. population.